Wales kept on course for a World Cup quarter-final place with a comfortable Pool D win over Namibia. Warren Gatland's side were 22-0 up at the break and Scott Williams secured the bonus-point try. Record cap winner Stephen Jones topped 900 points and George North became the youngest World Cup try-scorer. Aled Brew, Toby Faletau, Gethin Jenkins, Jonathan Davies, Lloyd Williams, Lee Byrne and Alun Wyn Jones also went over. Lock Heinz Koll scored Namibia's try, converted by Theuns Kotze. But the day in New Plymouth belonged to Wales and in particular two Scarlets youngsters as Wales rewrote their World Cup record book, with a winning margin that beat their previous best of 72-18 against Japan at the 2007 event. Wales took over in second place behind South Africa and if Samoa fail to earn a bonus point against the Springboks on Friday, Gatland's side can look forward to a quarter-final, in all likelihood against Pool C leaders Ireland on Saturday, 8 October in Wellington. There is also a mathematical chance of Fjji denying Wales progress if they beat Gatland's side with a bonus point and big winning margin. Scarlets centre Scott Williams, 20, went on to complete a hat-trick on his full debut and North added to the records with a World Cup try at just 19 years, 166 days old. Fly-half Jones kicked his first points two minutes after becoming Wales' record cap-holder with 101 Test appearances. Namibia were penalised at the first scrum to give Jones the chance. The Scarlets veteran was then unable to convert Wales' opening try. He had attempted to open up Namibia's defence with a cross-kick but, after that failed, Jones sent the ball wide to Jonathan Davies. The centre sent an inside pass to a busy Leigh Halfpenny and, as he had done against Samoa, the wing made good ground before sending Davies' Scarlets partner Williams haring down the touchline to score. Lock Bradley Davies beat two tackles after Davies's hack downfield and Lee Byrne won it back on the floor to set up Wales' second, handing over for Brew to cross. Jones added the extra points, doing likewise when Ryan Jones took a quick penalty before giving Faletau the time and space to power over. Williams, Brew and Faletau had all gone over within 17 minutes of the kick-off and after such a start it seemed Wales would secure the bonus point they were seeking by the break. Instead, as mistakes crept into their game and Namibia scrapped for every piece of possession, Warren Gatland saw his side lose their poise and shape, being penalised for sloppy offences at scrums and in the close exchanges. Kiwi referee Steve Walsh issued warnings to rival captains Sam Warburton and Jacques Burger over a variety of offences. But Wales' second-quarter efforts were summed up when they opted for a scrum instead of a kick at goal after lock Nico Esterhuyse's high tackle on Byrne. Gethin Jenkins charges towards the line for Wales The scrum was re-set after Namibia came in early, but at the second attempt Wales were penalised for collapsing and the opportunity was gone and the score remained 22-0 at the break. Faletau launched Wales' best counter-attack of the game to that point from his own 22, but after Williams, Davies and Halfpenny combined, Brew was unable to beat the last two defenders and lost the ball in the tackle. However, Wales' scrum pressure allowed Tavis Knoyle to steal the ball and launch the move that led to centre Williams brushing off tacklers to earn the bonus point. 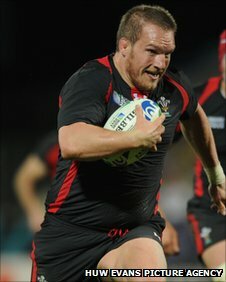 If Williams' 48th-minute try was a relief, what followed from Gethin Jenkins was spectacular. After taking Craig Mitchell's pass, he dummied on the 22 and burst clear before crashing over with three defenders on his back. Jones' conversion took him to 900 Wales Test points. But the fly-half then gave the intercept pass that allowed Esterhuyse to send lock partner Heinz Koll on an arcing 40-metre run to the line for Theuns to convert. But that was little consolation by the end as replacement wing North claimed his brace. Between North's scores, centre Davies got his reward for a good display by going over. Then Williams completed his try hat-trick, with Rhys Priestland - on for fly-half Jones - converting. Another late entrant, scrum-half Lloyd Williams went over before more established players Byrne and lock Alun Wyn Jones completed the rout.